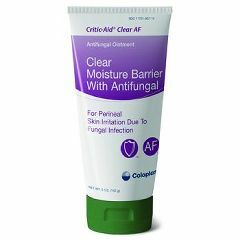 A clear, moisture barrier with antifungal, 2% Miconazole Nitrate. Contains petrolatum and dimethicone. Adheres to denuded as well as intact skin, is easy to apply and remove, and eliminates moisture. For skin irritation due to fungal infection. Provides all the benefits of Critic-Aid® Clear. Avoids two-step application which simplifies care, lowers cost and causes less trauma. clears up red heat rash. Prevents heat rash . Redness/ Blotchiness. Sensitive Skin. Daily Use. I went years trying to find something that would stop me from having heat rash under breasts and this works and keeps it healed I used the same brand of moisture protective ointment for everyday use. I purchased this last set for my sister an brother, because I was telling them how well it worked for me and they wanted to try it. Helps to keep heat rash in skin folds under control. Highly recommend product. Introduced to us during a hospital stay. Soothes Skin. helps skin folds heal. skin that cannot get air. Soothes Skin. Moisturizes. Lightweight. Works wonders . Works wonders . Used this to improve moisture protection and got a bonus - yeast infections on my skin all over my body were painful and bleeding but started clearing up immediately. by Busybee from Dadeville, Al. Moisturizes. Softens Skin. Lightweight. Soothes Skin. Large stomach apron overh. Incontinence. Daily Use. I use this on my mother daily. She is totally incontinent and has a large apron overhang. We cleared up her constant diaper rash and have kept it from coming back for over 5 months. It is the best barrier I have ever used, and I have been a nurse for 26 years. I recommend it to anyone who is incontinent.